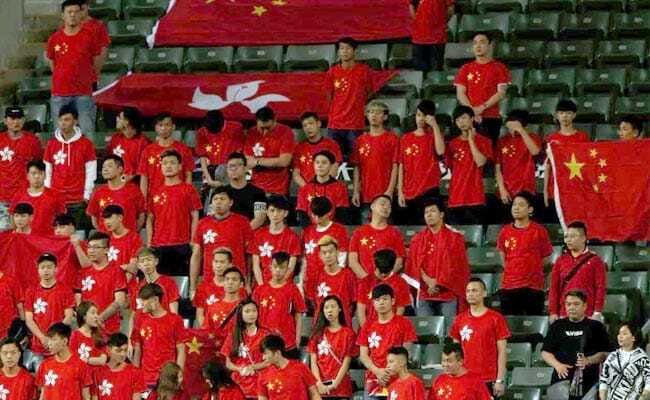 Hong Kong: Hundreds of Hong Kong soccer fans booed and jeered the Chinese national anthem at an Asia Cup qualifier match on Tuesday in defiance of Communist Party rulers in Beijing. The booing of the anthem, "The March of the Volunteers", has become a fixture at football matches in the Chinese-ruled territory, with some parallels to protests in the United States where American football players have knelt during the national anthem, an act denounced by U.S. President Donald Trump. Now the former British colony is preparing to introduce a law that will penalize people who boo the anthem, a measure that critics say undermines the city's autonomy and freedoms guaranteed when it returned to China 20 years ago. Details of the law, including jail terms and the scope of enforcement, have yet to be set. China extended the law to cover Hong Kong earlier this month. Chinese President Xi Jinping in recent years has ushered in new legislation aimed at securing the country from threats both within and outside its borders, besides presiding over a sweeping crackdown on dissent and free speech. Chinese officials have said the anthem law is necessary to safeguard the authority of the state. Several hundred fans greeted the anthem before the match against Lebanon with jeers and boos, with some unfurling banners that said "Die for Hong Kong", while others yelled "We are Hong Kong" in English, rather than the local Cantonese dialect. Some security guards signalled to the supporters to behave. "I'm not scared even if it becomes law ... I will go to the toilet instead of sitting when the national anthem is on," Hong Kong supporter Bendter Chong said when asked if he would continue to jeer the anthem when the law is enacted. Tensions between Hong Kong and mainland China have increased in recent years amid calls for greater democracy. Mass street protests in 2014 paralysed parts of the city although they failed to secure concessions on electoral reform from Beijing. Most of the jeering was from youths, underscoring how the younger generation has become increasingly disaffected by political tension and economic hardship. Security was tight at the Hong Kong Stadium, the venue for the city's annual Rugby Sevens tournament, where about 10,000 gathered for the match. The stadium has capacity for 40,000. The game ended Lebanon 1, Hong Kong 0. "I'm not sure about the law, but for sure people will be more behaved," said Hong Kong supporter Fai Chan. "But it is still a matter of whether it is worth our respect." Hong Kong returned from British to Chinese rule in 1997 under a "one country, two systems" arrangement that guarantees a high degree of autonomy, including an independent judiciary and freedom of expression. In 2015, Hong Kong football fans booed the Chinese anthem during a World Cup qualifier, prompting a fine for the Hong Kong Football Association from world body FIFA. The association was warned by the Asian Football Confederation recently over the conduct of fans and said "a repeat violation may result in more severe punishment".